My introduction to Randy Newman came even earlier than I realised. It was 1974, I was five and I was a few green months into primary school. Before the ruthlessly efficient, stripped-and-stranded TV scheduling of today, unforseen gaps would on occasion appear between programmes, in the grand interlude tradition of the potter’s wheel and the kitten frolicking. One such hole was plugged by a cartoon accompanying a song which told the commonplace story of a couple travelling through life. I hardly knew anything of such matters at the time but it appeared straightforward enough: meeting; marrying; having children. Only the last line of the song stuck but it haunted me for years: as I recalled, it was a female voice singing: “We’ll play checkers all day/until we pass away,” as the now elderly couple vanish from either side of the board. It may well have been the first time I gave any thought to mortality, so strange and sad did I find it. Scene fades…it’s now 14 February 1988. Without the remotest prospect of getting a card, it’s just another day for 19-year-old me but, it being a Sunday, Annie Nightingale is on and she’s doing a Valentine’s Day special, in which every song played includes the word ‘love’ in the title and is one more display of the sheer unpredictability of her show which reached its apogee the night she played Duran Duran and immediately followed them with Bogshed . I hear what are by now the familiar tones of Randy Newman – droll, drawling, dry – clothed in sumptuous orchestration which gives way to a similarly lush chorus echoing Spector with precision. Hints of Dixie jazz, hints of minstrel tunes – and then that lifelong game of draughts again. Love Story by Randy Newman – first part of the mystery solved. It would take the internet’s reduction of total mysteries to double figures before the puzzle would be complete. The first version I heard, complete with animation, turned out to be by Sonny and Cher – they’d performed it for their own show, even as it was rapidly losing autobiographical status for them. And Love Story turned out to be the opener of Newman’s debut album. 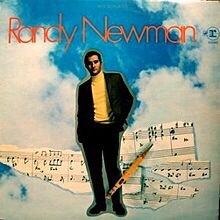 Even in 1968, its subtitle – Randy Newman Creates Something New Under The Sun – must have seemed a shade brazen. Though decades would pass before all the possibilities of Popular Music were finally exhausted, there was already an end-of-history mood prevailing. Psychedelia and its attendant adventures far from rock ‘n’ roll’s roots were already being dismissed by many – and still are to this day – as an aberration. Practically every leading figure released something that year which, while ranking among their best, was again holding fast to Earth rather than exploring further into space, even as the first lunar footfalls approached fast (years later, in his soundtrack for Apollo documentary For All Mankind, Brian Eno would explore the paradox of astronauts listening to country – one of the most Earthbound of all genres – as they ploughed through the vastness). But like The Band, and to some extent Bob Dylan, Newman was digging back further still. Not quite as far as The Band’s evocations of the Civil War but to the first third of the 20th century, a superficially genteel land of barbershop quartets, rocking chairs on antebellum porches and straw boaters tipped to every passing parasol-twirling dame, all the stranger for being well within living memory yet utterly bygone. He was steeped in this stuff, with with three composer uncles whose credits stretched from Modern Times, The Grapes Of Wrath and The Best Years Of Our Lives to Cleopatra and Alien. Characteristically, he embraced his heritage but with more than enough guile, bile and style to find favour with the burgeoning Serious Rock audience. As a practitioner of the now thoroughly debased (with a few exceptions, trite, wheedling and spectacularly point-missing in the 21st century) singer-songwriter genre, Dylan comparisons came like death and taxes…but listen to him singing “so hard” on Living Without You and then Boaby’s “so bad” and “so sad” on One Of Us Must Know and it’s valid for a moment at least. many of his songs have become better known through versions by others but few of these have improved on his. One of the best known covers is Three Dog Night’s version of Mama Told Me Not To Come, from 1970’s 12 Songs. Newman is said to have observed that they gave it a chorus he never did but I’ve always found their attempt pretty awful – I’m usually a sucker for electric piano but theirs is a smarmy burble and that chorus is in the type of hammy, overwrought voices which were all too prevalent at the time. They also had a stab at Cowboy, which is on Newman’s first album – it’s more tolerable but again, he triumphs easily – the verses are sotto voce but the arrival of the orchestra for the chorus is truly startling, batwing doors not so much flung open as breached with a battering ram. With Newman’s own arrangement and the deft production of stalwarts Lenny Waronker and Van Dyke Parks, it’s the sort of thing John Ford might have commissioned (commanded?) for one last bold sweep of Monument Valley before the credits roll. The lyrics, though, reflect more a Sam Peckinpah vision of a landscape changing too rapidly for its inhabitants to keep up with (“Cold grey buildings where a hill should be/Steel and concrete closing in on me.”) It was a reality for many as alleged progress rode roughshod over communities – Family offered a British perspective on the same theme later the same year with Hometown. I Think He’s Hiding is one of Newman’s numerous meditations on the nature, attitude and, ultimately, existence of God. Here, he offers the view of those who believe in both a merciful (“There’ll be no more teardrops/There’ll be no more sorrow”) and a vengeful (“When the Big Boy brings his fiery furnace/Will He like what He sees/Or will He strike the fire and burn us?”) deity before hedging his own bets to a hushed and subdued accompaniment. Even more minimal is I Think It’s Going To Rain Today, which has become possibly Newman’s most covered song – maybe because it’s so spare that there’s a widely felt need to embellish it. There’d be a decent album to be had from compiling the best versions but Newman’s would have to be among them – you strain to hear him whisper (even Leonard Cohen took 20 years to reach this depth of register) and when you catch what he says, it still seems densely enigmatic (“Scarecrows dressed in the latest styles/ With frozen smiles to chase love away). In its strange invocation of solitude in a sparse landscape, like many songs here it’s unequivocally American but deals in universal themes, in style as finely etched as a Whistler and in content as acutely observed as an Edward Hopper – and the whole album packed with these brilliantly crafted miniatures is over in under 28 minutes. excellent write up Johnnie … and as usual, you’ve made me want to go out and discover someone I’d not really listened to before. Randy Newman is a major gap in my music knowledge. Hello Huw, credit must go to my colleague Paul for the fine review. Randy’s first album is often bypassed for the ‘hit-yielding’ 12 Songs and Sail Away, both of which have their brilliant moments, but I would always go for the debut album and Good Old Boys (1974) which did feature in the original Perfect Collection. They are both marvellous. A man whose ability to write lyrics is right up there with the best.